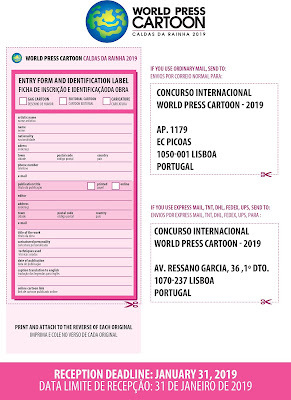 World Press Cartoon 2019 Lisboa, Portugal..
a) TheWorld Press Cartoon covers three main categories: Editorial Cartoon, Caricature and Gag Cartoon. b) The World Press Cartoon is not a thematic event. 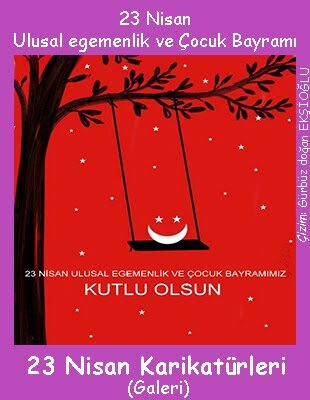 Its objective is to distinguish the best cartoons created and published in 2018.
e) Cartoonists are permitted to submit to the competition one original entry in each of the three categories of the salon: Editorial Cartoon, Caricature and Gag Cartoon. f) It is an essential prerequisite for eligibility that the works were originally printed between January 1 and December 31, 2018 in printed newspapers or magazines, published on a regular basis and on sale to the public, or in professional online publications of recognized journalistic nature. a) The submission of a completed entry form and identification label will automatically imply the waiving of the author’s royalties vis-à-vis the non commercial reproduction of his/her work. 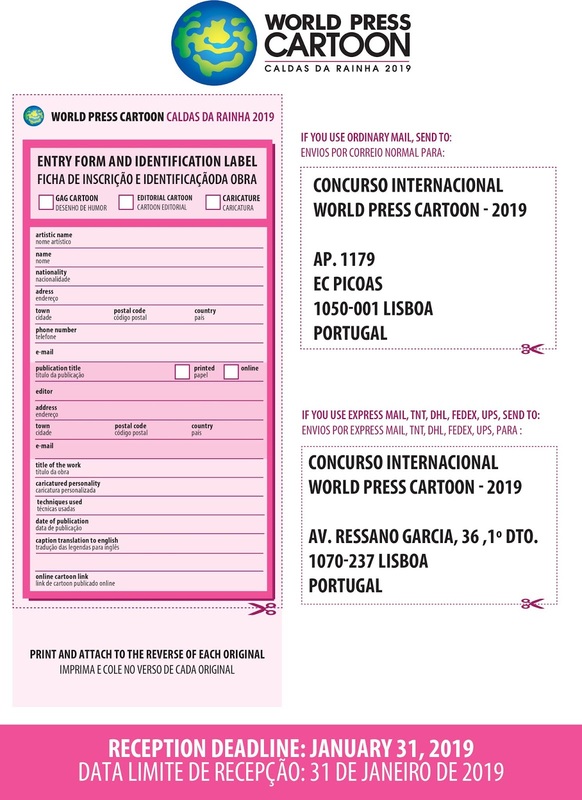 b) The awarding of a prize to a specific work will automatically imply the waiving of its author’s royalties to the organization of the World Press Cartoon. b) Chosen from all the entries in the competition, the World Press Cartoon will award the best work with the Grand Prix of 10 000 euros.